From the title alone you should have guessed this article is about Spain and its many customs. Spain is a very proud country, and they celebrate their history and customs in style. Get over to Spain so you can get your festival mood on the go. A well known festival The Tomatina (Tomato Fight), must be the worlds' biggest food-fight – every year 30,000 people take over the Spanish town of Bunol to hurl and lob more than 250,000 pounds of tomatoes at each other. The festival takes place on the last Wednesday of August and is basically an all out town-wide tomato fight. The tradition started in 1945 when a fight broke out among two members of a carnival crowd. A vegetable stall was nearby and every started throwing tomatoes. Exactly one year later, people met at the square, but this time with their own haul of tomatoes, and of course another food-fight prevailed, but was eventually broken up by police. Flamenco is another Spanish art known worldwide. Its around 200 years old and is from Southern Spain and is individualistic, yet structured. Song, dance and guitar are blended into passionate and romantic rhythms which are often spontaneous. Flamenco will have any themes, from politics, to love, to history, to humour. However, the tragic lyrics and tone of flamenco reflect the sufferings of the gypsy people whom the genre originated from. Flamenco exists in three forms: Cante, the song, Baile, the dance, and Guitarra, guitar playing and strumming. The singers' role is important with the guitar playing an accompaniment. The solo guitar flamenco has developed into a separate art form and is fused with jazz, blues and even pop. The dance side has extremely complex patterns of rhythm and footwork with the upper body emphasizing grace and posture, translating passion and romance, lust and hate. 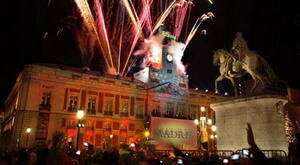 In the nations capital, the fiesta celebrations of New Year are spectacular – thousands of people flock together at Puerta del Sol, Madrid. In rhythm with the beats of the big clock at midnight, everyone attempts to eat twelve grapes. It should bring good luck for the coming year, and people who are not there, watch the televised event on TV. After midnight, the entire city becomes the scenery of a great fiesta. May in Madrid also sees Spain's most famous tradition, bullfighting, a sport visitors often ignore but the Spanish adore.